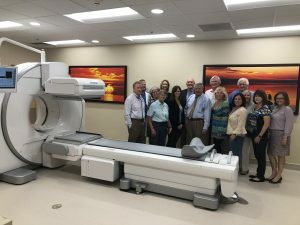 Tavernier, FL – January 17, 2019 – Mariners Hospital has added another promising new machine to its arsenal of advanced technologies: Through the generosity of donors – primarily those who supported the hospital’s 2018 Bougainvillea Ball – SPECT/CT is now offered at the facility. Considered a game changer in stroke care, SPECT/CT – representing single-photon emission computed tomography fused with computed tomography – can more clearly identify problems such as tumors, brain injuries and spinal fractures. In stroke care, the fine image detail shows how blood flows through arteries and veins in the brain and reveals blood-deprived areas following a stroke. It’s yet another major step in Mariners Hospital’s quest to become an accredited stroke center. For every minute a stroke is left untreated, an estimated 1.9 million neurons are destroyed. Clearer images increase the reading capability of physicians, enabling them to initiate earlier treatment decisions that improve patient outcomes. SPECT/CT technology also lowers patients’ exposure to radiation.